AlertMe have just announced that its web and smartphone enabled remote heating control service is now available in the UK exclusively from British Gas. 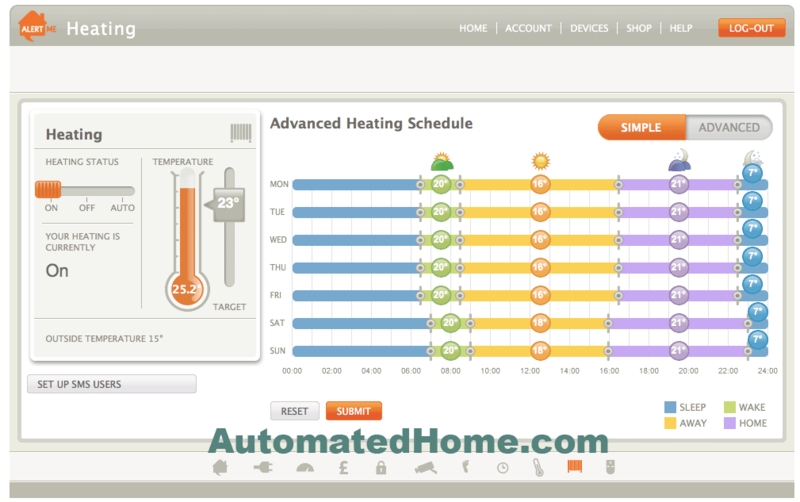 The system allows the user to easily schedule their heating from their computer or phone as well as easily override the settings on the go via the web interface, Smartphone app or SMS text message. “LONDON, 7 July, 2012 – AlertMe, the Smart Home technology company, today announces that its online and Smartphone-enabled Remote Heating Control service is now available in the UK exclusively from British Gas. Based on the AlertMe Connected Home platform, Remote Heating Control is a key application for home heating efficiency and makes working out thermostatic settings and programmes easy. It allows the user to set their weekly heating schedule to match their lifestyle but also alter or override the settings on the go via a web interface, Smartphone app or even by text message. The new service, which only requires a home fixed broadband connection*, is priced from £149 and includes a wireless-enabled programmable thermostat, a home hub and includes professional installation. Remote Heating Control is one of a range of affordable services that can be delivered over the AlertMe platform, which allows consumers to monitor, control and intelligently automate a range of devices in the home via a single user interface and log in. The platform is also designed to work with a wide range of third party devices in the home, allowing the user to build and extend their own personal Connected Home ecosystem. AlertMe’s strategy to partner with tier one companies in key markets and territories means it has the opportunity to reach a large number of customers through channels they trust and at the same time, help partners to transform the way they engage with customers. British Gas is the leading supplier of energy in the UK serving ten million homes. It also has the largest field engineering force in the country with around 10,000 engineers. Remote Heating Control will be offered as a standalone product and bundled with heating installation and maintenance services. 58% of the energy used in UK homes is spent on space heating and therefore more efficient use can have the greatest impact. British Gas research shows that households that leave their boiler on while at work or away for the weekend pay on average £140 extra a year. In addition to this, many homes with programmable thermostats just don’t get to grips with using them effectively – a 2010 US study by University of California – Berkeley and the US Institute for Energy and Environment found that 89% of consumers admit they rarely or never use their programmable thermostats to set a daily or weekly schedule. 1 Comment on "AlertMe Launch Web and Smartphone Remote Heating Control with British Gas"
I like this idea, but don’t fancy routing everything through AlertMe servers.